Before we start with the review let’s bow humbly before Joe Lizzi and Ben Young, the men behind Triple Point Records, a small label which has released only three albums so far. But these albums are Cecil Taylor’s/Tony Oxley’s double LP Ailanthus/Altissima (Taylor’s last release) and New York Art Quartet’s Call it Art, a five LP box set, for which the two were rightfully Grammy nominated – it is one of the most beautiful and simply greatest releases in the last two years as to music, design and liner notes (have a look here. Their latest effort is Frank Lowe Quartet’s Outloud and sometimes packaging says a lot about an album. In times where so much is reduced to a click on some data, it’s a pleasure holding some cardboard, vinyl and glossy paper. One of the striking things is the bold design with crisp lettering and a striking orange, white and black color palette. The design carries through the 38-page booklet that accompanies the double album release. The booklet is packed with historical, biographical, and technical essays, along with wonderful black-and-white photography and scrapbook entries of concert posters and tickets stubs. There is also an online access code to rare video footage of the band in action. These passages, among many others, help paint a picture of what music meant to Lowe and the context for the music being made. First of all, this double LP is a release from tapes made at Sam and Beatrice Rivers’ East Village loft and it is a gem rescued from the unforgiving entropy of time. Like much of the music from the Wildflowers: The New York Loft Jazz Sessions compilation from a around the same time and recorded at the same loft, the music here captures the zeitgeist and presents Frank Lowe as one of the most interesting musicians of that scene. Out Loud’s concert dates were recorded after Black Beings (on ESP-disk) and before Lowe's seminal album Fresh (on Arista). The group that Lowe (saxophones, flute, voice, percussion, balafon, whistles, harmonica, and miscellaneous small instruments) had assembled for the Out Loud recording dates included William Parker on bass, Steve Reid on drums, Joseph Bowie primarily on trombone and also featured a guest appearance by trumpeter Ahmed Abdullah. More raw and less programmatic than Fresh (which also had a slightly altered line up), the group plays with exuberance and joy throughout the four sides. Percussion, slide whistles, vocalizations and chants also capture the spirit of the times. Lowe’s compositions on this album are influenced by Sun Ra’s percussive style (like drummer Steve Reid he was a member of the Arkestra) and integrated the Art Ensemble of Chicago’s African elements (he worked with Joseph Jarman on Black Beings and with Lester Bowie on Fresh) which he combines with his aggressive and fiery blues style. The most outstanding moments on this album are those when these structures crash into young William Parker’s bass ostinatos, relentlessly pushing the reeds, for example in “Untitled 2”, a fierce, angry social comment with Lowe even screaming and shouting; or in “Untitled 3”, where Lowe is challenged by Reid and Parker hunting him down a rollercoaster of musical emotions – blues cries that remind of Ayler, balladesque breathers, hardbop bass lines and ultra-fast drumming. When Ahmed Abdullah joins in, the rhythm section plays the same game with him. And last but not least there is Joseph Bowie, then in his early twenties (in general it is amazing how young these musicians were). He accompanies Lowe like a loyal Sancho Pansa but he also fights him and the others in “Vivid Description” and especially in “Whew”, in which his trombone gives Lowe the crucial hints where the music should go. 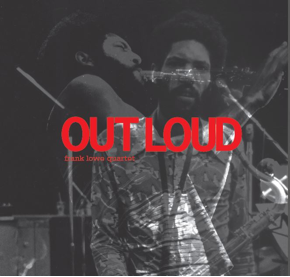 Outloud is on par with Albert Ayler's Holy Ghost: Rare And Unissued Recordings (1962-70), Bill Dixon’s Odyssey, William Parker’s Centering: Unreleased Early Recordings 1976-1987 and Joe McPhee’s Nation Time: The Complete Recordings (1969-70). The album is available as a deluxe double vinyl edition, it is limited to 550 hand-numbered copies. It is expensive but it is worth every cent. You can buy it from the label where you can also find a sound snippet. Have a look at the photos and the booklet here. Nice review, although rather ironically, "free" jazz seems often to be the province of the well-heeled at the moment. Agreed. Whilst I am a great subscriber to the fetishism of the physical object, and would dearly love to have all of Triple Point's releases in my collection, $94 for an double LP….. Compare this to the Black Saint/Soul Note box set reissue series and for less money one could have; 7 x Henry Threadgill CDs, 8 x Anthony Braxton CDs AND 9 x Bill Dixon CDs. As the quality of the musical content is comparable from both labels, as beautiful as Triple Point releases are it strikes me as some very expensive window dressing. I know it is a lot of money and the ambiguity of the word "free" seems ironical indeed. Compared to the Black Saint/Soul Note boxes those seem the better deal as to quantity. On the other hand the production design is simply outstanding, especially compared to the poor standard of the Black Saint/Soul Note boxes. To me this is like a luxury hardcover version of a novel compared to a paperback version. But it is totally understandable to spend your money on CD boxes if you can't spend that much on expensive vinyls. Additionally, Triple Point has an excellent reputation as to paying musicians and/or their legal successors very correctly. Although the comparison with the boxed sets with accompanying booklets you mention is understandable, this is a recording of a single performance only, and I wonder whether a more accurate comparison might be with the recordings of gigs from the 70s and 80s released by NoBusiness on LP and CD at a fraction of the cost (without booklets). Also, for purchasers of this album outside the U.S., the postage costs are now horrendous, on top of an already expensive album. Great review but it's just such a shame that so few people will hear this music at this price point. No matter how you dress this up, and by all accounts it's very nicely dressed, this is an overpriced release surely. It's not as if Lowe was a musician that revolutionised music in any way so there isn't that importance. Other labels can pay artists (e.g. Nessa) and not have to charge exorbitant prices. It may be a 'hardback' edition with sumptuous production values and well researched accompanying notes but when in comes down to it is 80 minutes of Loft Jazz - probably very good Loft Jazz but nothing else. I hope this exclusivity through pricing doesn't become a trend as I can't see anything positive in it for the music. I guess I can look at it whatever way I want: it's simply a very, very expensive (maybe even too expensive) LP but on the other hand I allow myself something really nice like this from time to time. I still would call it excellent loft jazz though, but on the other hand Colin is right: the horrible shipping costs go beyond a normal financial frame. Still, triplepoint seem to go in a right direction considering the fact that the Taylor/Oxley was even more expensive and in that case the production design was nothing special. Let's see where it goes. And: It's Christmas soon :-). I wish it were also available digitally, preferably as a high res download of some sort and not MP3. Then those of us who, for whatever reason, do not have the equipment needed for vinyl could also purchase it. 'It is worth every cent'. So, did you buy your review copy or was it a freebie? Just asking. his review copy or was it a freebie? Your failure to allow me to post this question speaks volumes about the integrity of this blog. Anonymous, spam policy requires that comments on older posts need to be approved. No conspiracy here. I buy almost all of the stuff I review on this site. And of course I bought this LP as well. And I still think that it is worth every cent I spent on it. This album, and Triple Points other productions, strike me as the ultimate expression of the vinyl fetish that seems to have taken over. Don't get me wrong, I love vinyl, but the whole vinyl craze seems to have jumped the shark, viz, nearly $100 for this Frank Lowe album. This has nothing to do with the music as such. In fact, by asserting the exclusivity of these high-priced products, many people who would love to hear the music will not be able to. AGM -- a British purveyor of vinyl fetish products is Gearbox Records, with an equally annoying habit of effectively taking historical recordings out of circulation for the vast majority of potential listeners. Would such companies really sell fewer copies on vinyl if they also issued the music in a more accessible format? I doubt it. AGM -- I have similar feelings about Gearbox Records in the UK, who also produce exclusive vinyl editions of historical material to the great frustration of the majority of music fans who would prefer a more accessible format at a more reasonable price. None of these musicians and most of their peers would not be able to afford to buy this release.